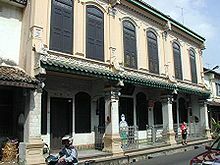 Born in Malacca in 1944, a beautiful city, 150 kilometers south of Kuala Lumpur, where successive influences are mixed: Malay and Chinese from the 15th century, Portuguese and Dutch, then British in the early 19 th century. 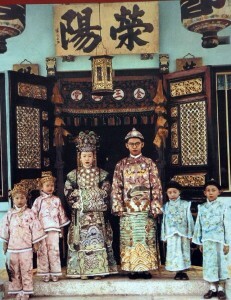 Her grandfather,a Hokkien, migrated from the Chinese province of Fujian; one can not go into details of the fascinating history of the Chinese in Malaysia, but it should be noted that her father is the only one among six brothers to get married to a Peranakan woman, a Malay and Chinese mixed blood. Shirley (a name given by her father admirer of the actress Shirley Temple), Geok (jade in Hokkien dialect) Lin and Lim her family name. Names which sum up the complexity of influences and origins. She speaks little Hokkien and does not write in Mandarin, she exchanges in Malay with her mother and her father only speaks in English to his children, irritated at having been despised by his family for marrying a Peranakan wife who has not much left of her Chinese culture. She was baptized, attends a school run by nuns, a British colonial school. English has built her personality and provides the opportunity to escape a society,repressive and conservative towards women. The shoe business of her father collapses, her mother abandons her five children and her father begins to live with Peng, the daughter of their servant with whom Shirley will have limited contacts. Poverty and hunger will last several years. Her father will then play a role as a writer, preparing public records for the Chinese who apply for Malaysian citizenship. 2 / Malaysia, a multiracial society? In 1957, the Federation of Malaya became independent. Tensions between communities occur rapidly; only the Malays were granted citizenship of the country by the British authorities, suspicious towards the Chinese that they often saw as temporary immigrants. Racial prejudice is strong: the Malays against the Chinese and vice versa, Malays and Chinese against Tamils and Eurasians. Mixed marriages with the Malays are uncommon because the conversion to Islam is mandatory. Malaysia and Singapore ( in majority Chinese) split in 1965. At university, in Kuala Lumpur, she wants to believe in a Malaysia, independent, integrated and multi racial. The preeminence of the national language, Malay, is gradually enforced and friends do not understand her love for the English language and literature. The debate concerning “special rights” for the Malays becomes tense and ends up in the anti-Chinese riots of May 13, 1969 with several hundred deaths. The position is clear: political leadership for the Malays, affirmative actions in the economy in favour of the Malays in order to correct the overwhelming supremacy of the Chinese and foreigners. It is for her the end of a dream and her departure for the U.S.will show her another approach to politics and civic identity: what was not possible in a stratified society like Malaysia, allows in the U.S. to build civic and social identities. A doctorate at Brandeis University and a teaching position in literature in colleges from suburban New York. Her father dies, she finances the education of her brothers and Peng children. She meets Charles, an American Jew from New York and marries him. Her professional integration is not easy with unmotivated students and colleagues not accustomed to work with a woman and an Asian. She develops feminist positions in response to the attitude of her male colleagues, while previously she had largely favored the company of men. She publishes in 1980 a first collection of poems which was awarded the Commonwealth prize, a first time for a woman and an Asian. Having just given birth to her son, she can not travel to London to receive the award. She also becomes an American citizen. Other books will follow with poetry and short stories. She supports the works of Sino-American writers with academic essays and anthologies (2). She taught a few semesters in Singapore where she reconnects with her mother who died in 1984. 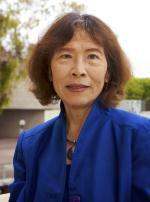 She was appointed in 1990 at the University of Santa Barbara and now lives in California. 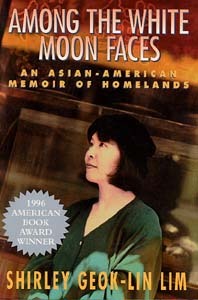 “Among the white moon faces” in 1996 received the “American Book Award,” a prize which acknowledges the qualities of an honest and detailed account, which shows a deep investigation in the phenomena of multicultural societies and social integration as a teacher and as a woman. This book is never dull, it is funny, humorous and leads you to discover the beauties and challenges of Malaysia. She is a teacher for nearly a year in Singapore, which will not be forgotten in her novel “Joss and Gold” (3), an interesting book, an acid vision of the American woman’s hero Chester and women’s lives in Singapore. Li An, a Chinese Malaysian, unhappily married, shares a bed with Chester, a young American Peace Corps, one night during the riots of 1969. The birth of a daughter ends up with a divorce. Chester, married in the United States to a woman who refuses to have children and imposes her career and a vasectomy, will learn ten years later that he is a father. He contacts, in Singapore, Li An who has become an independent business woman raising her daughter with some difficulty because of prejudice against single mothers and mixed blood. Social pressure in Singapore, the necessity never to lose face and to show success permanently, are well described although the novel sometimes lacks dramatic developments. I am less enthusiastic with the short story collections such as “Two Dreams”, which often take inspiration from episodes from her life in Malaysia looking too much for spectacular, unexpected and sometimes artificial endings for some of these texts. One must also note the importance of her role as a teacher, passionate about her work and her students, convinced of the role she can play in Singapore and especially Hong Kong as demonstrated in an excellent interview in September 2000. (1) “Among the white moon faces”, The Feminist Press, New York 1996, 230 pages. (2) “Asian American literature, an anthology,” NTC PublishingGroup 2000, 560 pages. 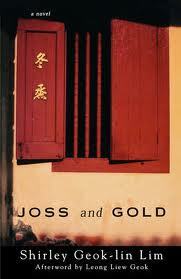 (3) “Joss and Gold”, The Feminist Press. New York 2001, 270 pages. (4) “Two Dreams”, The Feminist Press. New York 1997, 220 pages.